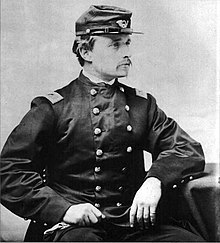 Robert Gould Shaw (October 10, 1837 in Boston, Massachusetts – July 18, 1863 in Morris Island, South Carolina) was a colonel during the American Civil War. He led the all African American 54th Massachusetts Infantry Regiment. Shaw died leading his troops attacking Fort Wagner in 1863, aged 25. This page was last changed on 15 September 2017, at 21:14.